Synonyms: anatomize, consider, categorize, classify, differentiate, dissect, distinguish, examine, evaluate, explore, inquire, inspect, investigate, probe, question, query, research, review, scrutinize, separate, study, survey, test. 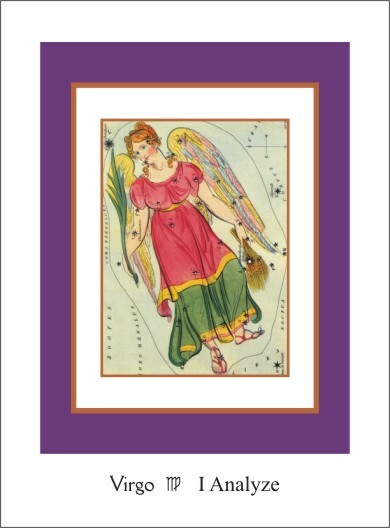 The companion Spiritual Virgo exercise by Christopher Gibson is accessed by clicking here. According to Zain, Spiritual Virgo has much to teach us about our own consciousness and how it grows as a result of experience with contrasts. To illustrate the lessons of Virgo Zain uses the story of Adam and Eve in the Garden of Eden. The Garden of Eden represents the state of the soul's development along the path of the Cycle of Necessity in which the twin souls are united and blissfully unaware. They are like the cherubim or baby angels, vitally alive but limited in ability and consciousness. The fruit of both trees is forbidden to Adam and Eve. The “Tree of Life” is located at a great distance—across the zodiac in one of the decanates of the opposite sign Pisces. The tree of “Good and Evil” is located within the boundaries of the Garden—an ever-present possibility. AAdam, in typical male fashion moves forward along his straight path while Eve follows a more sinuous path. The curvature of her path widens her horizons and one day she happens upon a serpent occupying the “Tree of Good and Evil.” Engaging Eve in conversation the serpent tells her of all the possibilities that are within her reach. Among these tantalizing possibilities is the acquisition of knowledge and wisdom, giving her great power. All she has to do is partake of the forbidden fruit. Convincing herself that eating the forbidden fruit is a desirable thing to do, she takes the fruit to Adam telling him of her encounter with the serpent. Together, they choose to partake of the fruit. Breaking the cardinal rule to not eat of the forbidden fruit, a blissful, unconscious existence is no longer possible and they are cast out of the Garden. Outside the garden they see things they hadn't noticed before. Now they see dark and light; feel hot and cold; experience happiness and sadness. These contrasting experiences awaken their nascent consciousness. Now they know they are naked, hungry and without shelter. They begin to think about and work to acquire clothing, nourishment and shelter where they can feel protection, peace and happiness. The suggestion is made that Adam and Eve are cast from the garden as a punishment. This would make sense from the exoteric Judeo-Christian tradition where the serpent is portrayed as evil. However, in the esoteric occult tradition the serpent is associated with Wisdom. Wisdom comes from experience. Maybe in the long run (from the perspective of “progressive evolution”) being cast out of the garden isn't such a bad thing? Consider this proposition: What if Adam and Eve do not experiment with the fruit? They do not follow their inner urging. They are still in that Garden, blissfully unaware, without need to develop their abilities or accomplish anything. If this were so, then there would be no stories to tell. Thankfully, depending on one's perspective, this is not what happened and we, their children, are free to have our own experiences and consequently to notice, feel, distinguish, analyze, choose—to be conscious and find our way back to the Garden. The price we pay for this freedom is the work we must perform in order to gain knowledge, to expand consciousness and make sense of our experience; thereby gaining the ability to survive and ultimately thrive when successful. Zain associates the garden with the earthy sign Virgo where the Sun passes from August 23rd to September 23rd. It is the harvest season where the fruits of one's labor are gathered and the selection process of analyzing which food is acceptable is in full swing. The ability to separate and analyze is associated with Adam and Eve partaking of the fruit of the tree of “Good and Evil.” In fact, the Key phrase for the sign is, I Analyze. To know if something is good or bad for you it is necessary to gain knowledge about it. The only way to do that is through experience and growing one's ability to differentiate. “Like Eve, people born when the Sun is in Virgo are inveterate askers of questions, always wanting to know how things work. It was quite in character that Eve should discuss the merits of the tree with the serpent, or with anyone else who would talk with her about it. She wanted to know all there was to know about the tree and about everything else. And after talking it over with the serpent she decided, after all, that the tree of knowledge was good for food, pleasant to the eyes, and to be desired as making one wise. The companion Spiritual Virgo exercise by Christopher Gibson can be accessed by clicking on the image below or here.